Cold Spring Harbor, NY — Zachary Lippman, Ph.D, a Cold Spring Harbor Laboratory (CSHL) Professor and Jacob Goldfield Professor of Genetics, has been selected to be a Howard Hughes Medical Institute (HHMI) Investigator. Dr. Lippman is among 19 other scientists who have just received this distinction. HHMI also announced that it will invest $200 million in this newest group of investigators, who were chosen because of their groundbreaking research. “We selected these scientists because they know how to ask hard and interesting questions with skill and intellectual courage,” says David Clapham, HHMI’s vice president and chief scientific officer. Dr. Lippman’s work in plant biology has garnered interest both within the scientific community and the public at large. 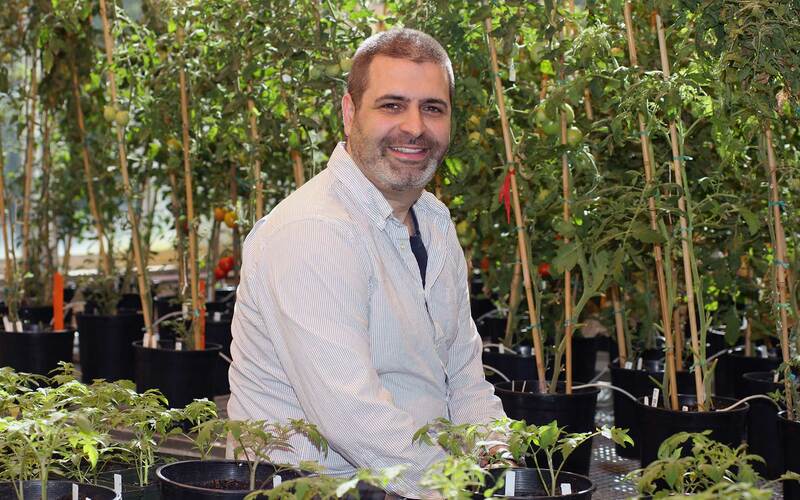 His research focuses on the genes that determine when, where, and how many flowers are produced on a plant, using tomatoes as a model system. Employing a combination of genetic, genomic, and molecular approaches, he is dissecting the gene networks that are responsible for the variation in how flowers form on the reproductive branches of plants called inflorescences. In doing so, he is developing new principles and strategies for improving crop yields. Lippman has accomplished much in his early career. His work on the genes responsible for the production and activity of a universal flowering hormone, known as florigen, has resulted in novel approaches to fine-tune plant architecture and flower production, helping boost yield beyond leading commercial varieties. Additionally, his lab has determined the genome sequence of the “currant tomato,” the wild ancestor of larger-fruited cultivated tomatoes, which helped researchers better understand how flower and fruit production changed during the process of crop domestication. Lippman is not only a professor at CSHL, but also an alum of its graduate school, the Watson School of Biological Sciences. He has won the Winship Herr Award for Excellence and Creativity in Teaching twice for his excellence in instruction. He joins Drs. Leemor Joshua-Tor and Rob Martienssen as CSHL researchers who have been honored as HHMI Investigators. The Howard Hughes Medical Institute is dedicated to discovering and disseminating new knowledge in the basic life sciences. HHMI grounds its research programs on the conviction that scientists of exceptional talent and imagination will make fundamental contributions of lasting scientific value and benefit to mankind when given the resources, time, and freedom to pursue challenging questions. The Institute prizes intellectual daring and seeks to preserve the autonomy of its scientists as they pursue their research. Founded in 1953 by aviator and industrialist Howard R. Hughes, HHMI is headquartered in Chevy Chase, Maryland, and employs more than 3,000 individuals across the United States. It has an endowment of $14.8 billion.